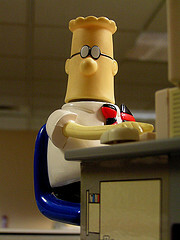 Dilbert on the economic crisis - Brilliant! But I think the economic crisis is more like having a few sick cows along with some healthy cows, then grinding up all the cows into a big pile of hamburger and distributing the hamburger all over the world. How do you know if the hamburger you received does not contain any of the sick cows? You don't. Which is the problem with making hamburger this way (which we do, BTW), and with the "securitizing" of home mortgages.